Seun Kuti named among performers for 2019 Grammy Awards – Royal Times of Nigeria. 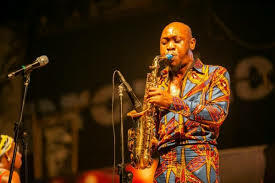 Nigerian Afrobeat musician, Seun Kuti, will perform at the 2019 Grammy Awards, the Recording Academy announced on Saturday. The youngest son of the Afrobeat pioneer, late Fela Kuti, took to his Instagram handle to hint on his performance at the event coming up on February 10. 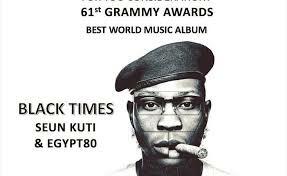 The 36-year-old Afrobeat singer and his band, Kuti and Egypt 80, had been nominated in the Best World Music Album category for “Black Times” released on March 2, 2018. His Grammy nomination in the Best World Music Album category is his first. He carries on a family trend of being nominated for an award at the Grammys. His brother, Femi Kuti, was nominated four times; in 2003, 2010, 2012 and 2013 respectively.